The Church of Oprah at last shuttered its daytime chapel Wednesday, with its world famous preacher of self-worth repeatedly telling her in-studio and at-home parishioners to keep her faith. 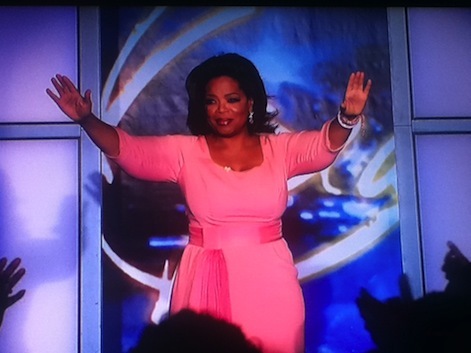 A vision in pink after absorbing two previous days of A-list adulation on Oprah's Farewell Surprise Spectacular, Winfrey billed her final one-woman show as "my love letter to you." There was no pulpit, but it wouldn't have been entirely out of place. Her closing words, delivered firmly if a bit tearily, cast her hardscrabble journey to a quarter century of TV super stardom as "this yellow brick road of blessings." "I thank you for being as much of a sweet inspiration for me as I've tried to be for you," she said. "I won't say goodbye. I'll just say, 'Until we meet again.' To God be the glory." Steadman gets a little sugar from his longtime gal pal. She then strode into the studio audience to give her longtime beau-in-residence, Steadman Graham, a grateful hug and kiss on the cheek. Some added final images had Winfrey appearing almost Christ-like before the faithful, outstretching her arms before ascending to . . . er, leaving the stage. Winfrey's voice caught just once, when she recalled her very humble origins as a rural Mississippi kid while a vintage black-and-white photo appeared on-screen. She often felt unloved during her childhood, but "you and this show have been the great love of my life." By her count, she hosted 4,561 editions of The Oprah Winfrey Show, never missing a single one of them "because you were here." Many of those shows -- 217, she said -- addressed the sexual abuse of children. Winfrey eventually went public with her own story of sexual abuse as a child, as did one of the handful of celebrities in Wednesday's audience, actor/producer/director Tyler Perry. He briefly acknowledged her praise for his efforts on behalf of other men who unashamedly "stood up" to tell their own stories of child molestation. Winfrey also briefly saluted her fourth grade teacher, "Mrs. Duncan," as "my first true liberator" who "made me feel that I mattered." She had asked to be there for Winfrey's final show. And it was a nice moment when her former troubled student turned the camera on kindly old Mrs. Duncan. The finale had a smattering of clips from previous shows. But mostly it was Winfrey preaching her gospel and repeatedly thanking those who devotedly stayed the course "in this classroom called The Oprah Winfrey Show." The Supreme Being got a good deal of credit, too. 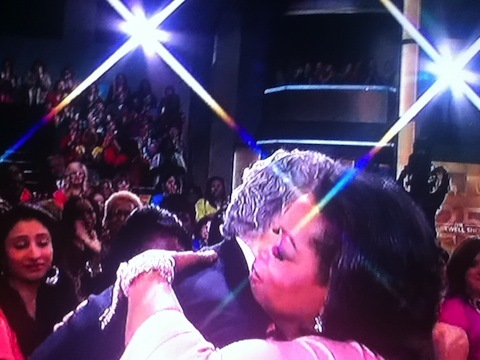 "Nothing but the hand of God has made this possible for me," Winfrey said. "I have felt the presence of God my whole life. God is love. And God is life." In D-FW, ABC station WFAA8 and The Oprah Winfrey Show have been life partners from the very start. Save for the first year or so, Oprah has been a fixture at 4 p.m. weekdays. And for years she also was a powerhouse ratings magnet, lifting both the audience and the profits of WFAA8's 5 and 6 p.m. newscasts. One of Winfrey's proteges, Dr. Mehmet Oz, is scheduled to inherit her 4 p.m. slot in D-FW next fall after airing at 3 p.m. for the past year. WFAA8 also has a one-year deal with Anderson Cooper and his new talk show, which likely will replace Dr. Oz at 3 p.m. The Oprah Winfrey Show otherwise lives on in reruns this summer while its namesake tries to lift the so far lackluster ratings for her fledgling OWN cable network. OWN's her new baby, but "You and this show have been the great love of my life," she testified on Wednesday's finale.